Meal prep wasn’t a priority for my family when we first made the choice to eat real food. At the time, I was a new stay-at-home mom with a sleepy baby. I had more time to spend in the kitchen at this point. And what a blessing it was to enjoy this slower, although challenging, season of life. As a real food newbie, I had time to flex my cooking muscles and learn how to prepare meals using real ingredients. Meal prep wasn’t a necessity. Fast forward a few years. 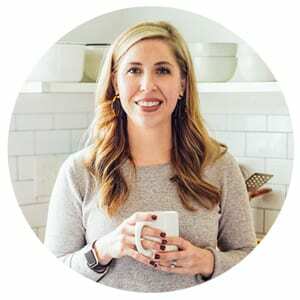 With two children, both in school during the week, and both Dustin and I working full time, eating real food on a daily basis became a challenge. How were we going to juggle this new season of early mornings, school drop off, only having a few hours during the day to squeeze in work responsibilities, and family life in addition to enjoying a real food lifestyle? 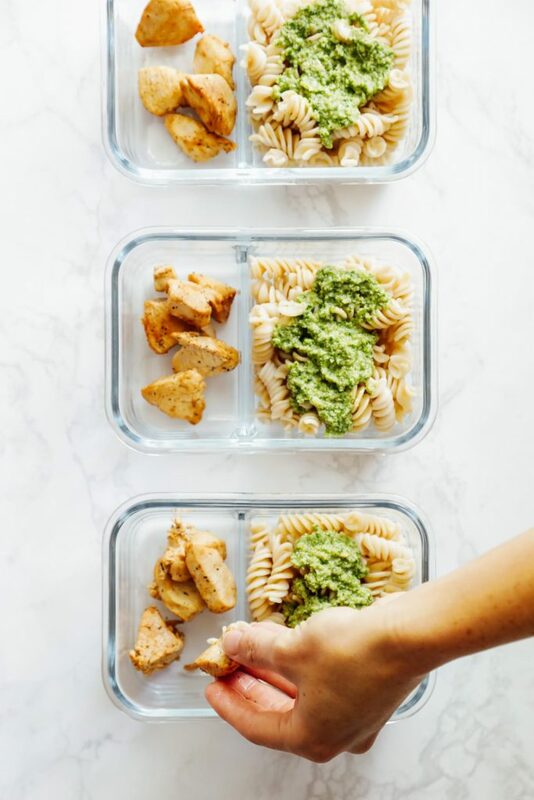 It was at this time, thanks to Pinterest, that meal prep caught my attention. During my first few meal prepping sessions, I tried to do it all: prep all dinners for the week and lunches and breakfast. Oh, and creative snacks definitely had to fit in there, too. I’m sure this method works for some people, but it didn’t for me. 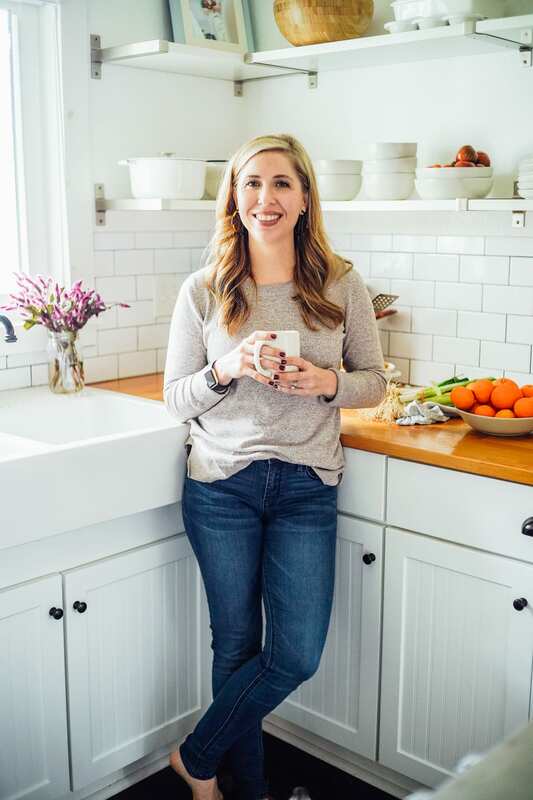 Instead of thinking about everything we were going to eat in the upcoming week, and trying to prep everything at once, I began to focus on prepping the biggest stressor(s). For our family, breakfast and lunch are stressors. (Maybe stressors isn’t the word. That sounds so negative. But you get what I mean, right?) So much has to happen in the morning: a nourishing breakfast needs to be served, lunches packed, everyone needs to get fully dressed (including myself–I once forgot my shoes), kids needs to be dropped off at school, etc. With a bit of prep, some of these stressors can be eliminated. 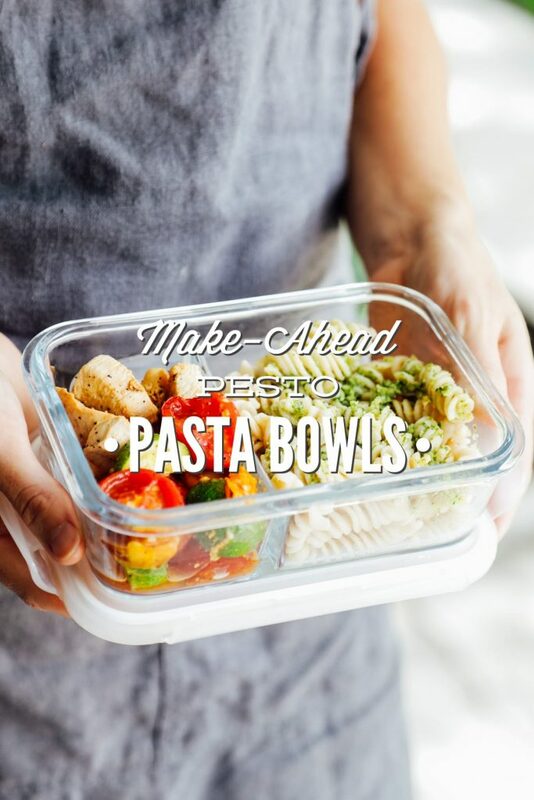 Because that’s what meal prep is all about–simplifying life! For about a year now, breakfast and lunch have been my meal prep priority. No more trying to do it all. 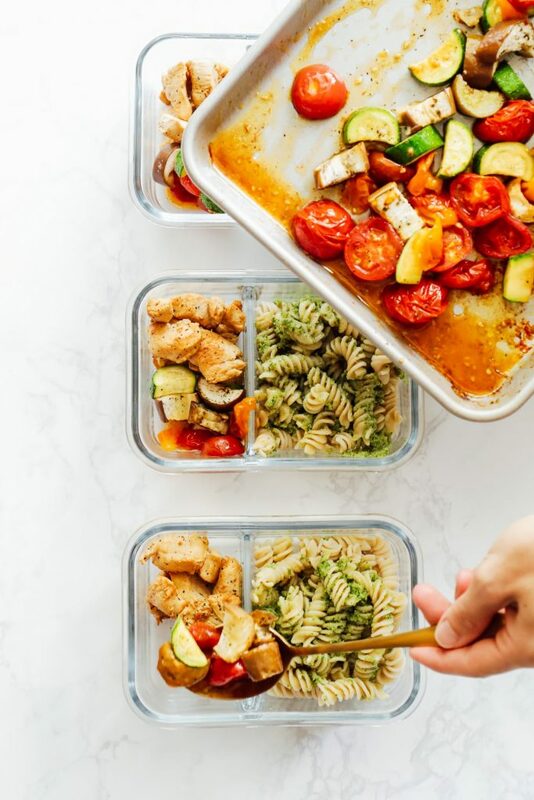 Instead, focusing on just a few key foods–based on our lifestyle and schedule–has helped simplify our lives and meal prep. This approach has worked for our family. It’s simplified our lives in a small but very important way. The key to meal prep “success” is to determine what will simplify your life. This is something you have to think about on a weekly basis. Think about what stressors you can eliminate from your life each week with some intentional prep. Maybe right now this means making one breakfast item that will help you start your week off with ease. A few months from now, prepping a few lunch options in advance may be more important than breakfast prep, or maybe just as important. A few months ago, I shared a photo of a make-ahead lunch. The requests for this recipe rolled in via Instagram message, so here we are today–making one of my favorite make-ahead lunches at the moment. Even Dustin and the kids love this lunch. 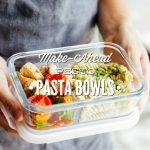 The bowl-style lunch is easy to make, and highlights the freshness of the summer season: basil pesto and fresh veggies (including sweet summer tomatoes). 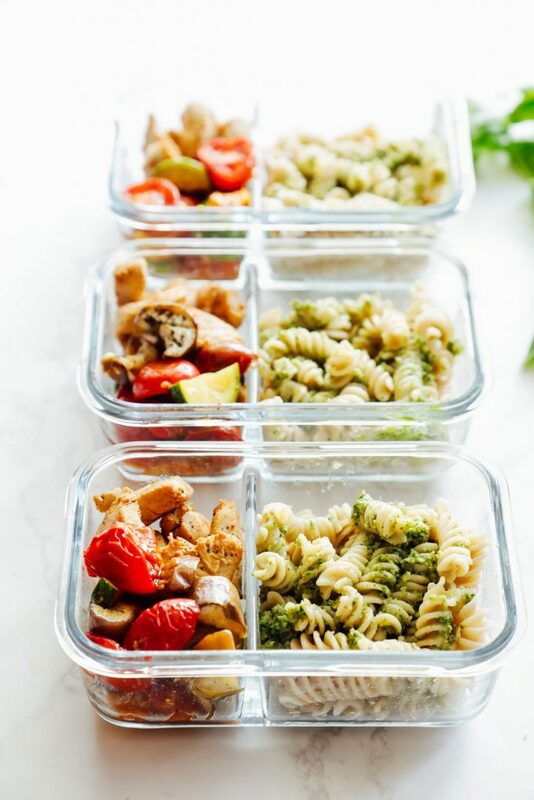 From-scratch pesto is combined with pasta, chicken, and roasted veggies for a make-ahead pasta bowl-style meal. Cook the pasta according to the instructions on the package. Combine the chicken marinade ingredients (olive oil, lemon juice, salt, and pepper) in a bag or shallow container. Place the sliced chicken in the marinade, and then place the bag or container in the fridge for about 30 minutes. Preheat the oven to 425F. 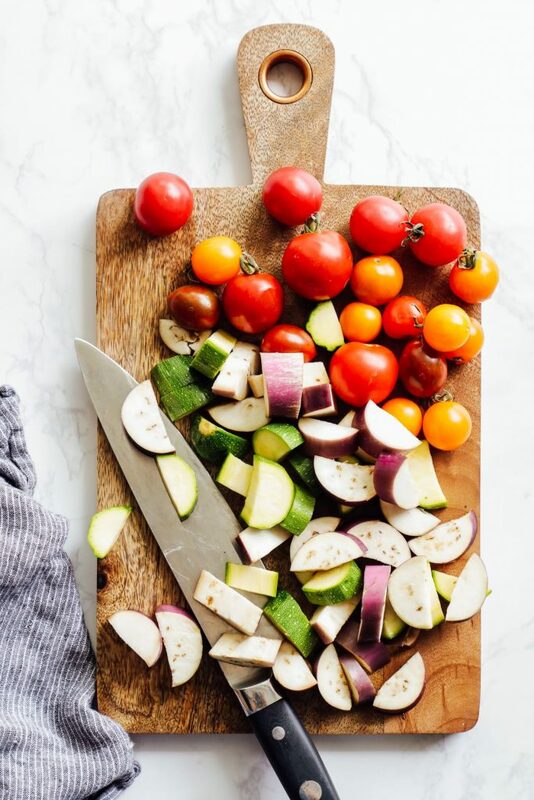 Spread the veggies on a large rimmed baking sheet. Drizzle with olive oil, salt, and pepper. Toss to combine. Roast for 25-30 minutes, or until soft and cooked through. 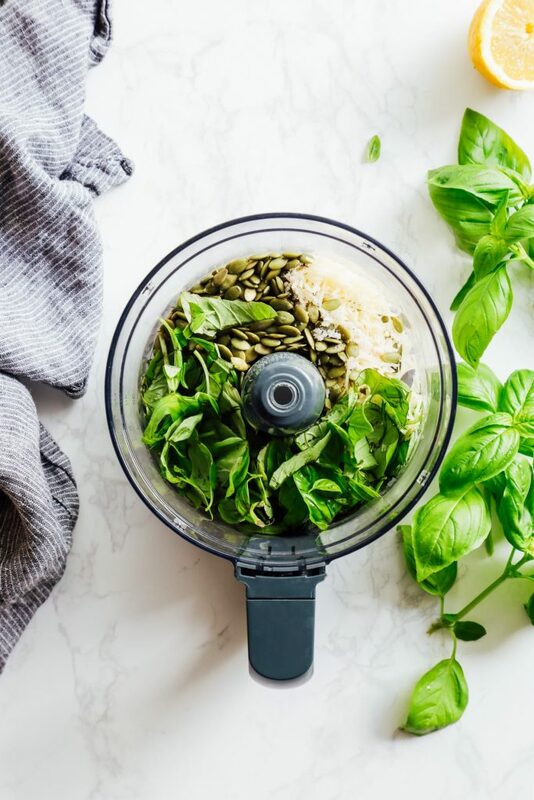 Place all the pesto ingredients, except the oil, in a food processor. Pulse until the ingredients are crumbly. Slowly add the oil while pulsing the food processor. Lightly grease a large skillet (or the same pot used to cook the pasta) with oil. Heat the skillet over medium-high heat. Add the chicken to the skillet. Saute the chicken until brown and cooked through, or about 7-10 minutes. 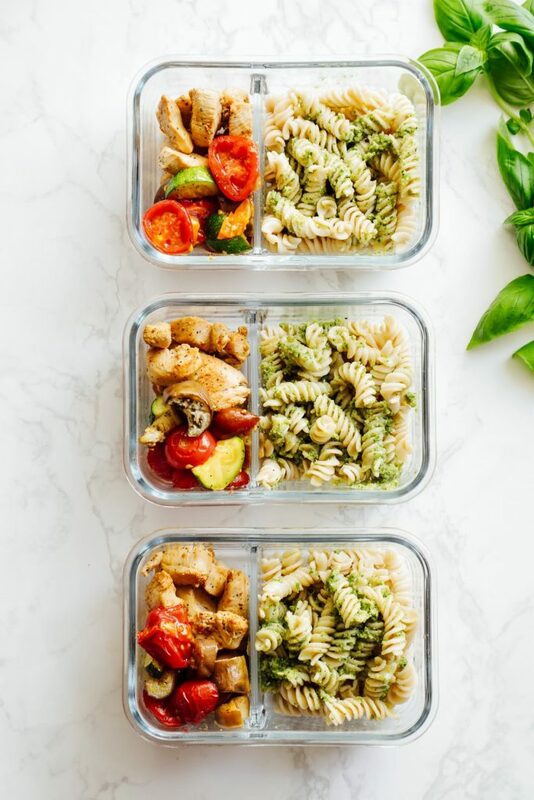 In meal prep containers, divide the ingredients: pasta mixed with a spoonful of pesto (about 1 tablespoon, more or less depending on preference). Evenly divide the chicken and veggies amongst the containers. The make-ahead meals will keep in the fridge for 4-5 days, if your chicken is fresh. This recipe is also a great dinner meal. You don’t have to prep this meal as a make-ahead lunch. Simply follow the instructions and serve mixed together like a big pasta salad. If you want to make this meal vegetarian-friendly, or just want a lighter lunch, skip the chicken. Stove-Top Method for Veggies: If you'd like to avoid using the oven, sauté the veggies in a deep skillet or dutch oven, in olive oil, until soft and cooked through. Seasonal Veggies: Change up the veggies in this meal by using any seasonal veggies that roast or cook well. You could even use raw veggies (like chopped cucumbers, tomatoes, and radishes) for more of a raw pasta salad. 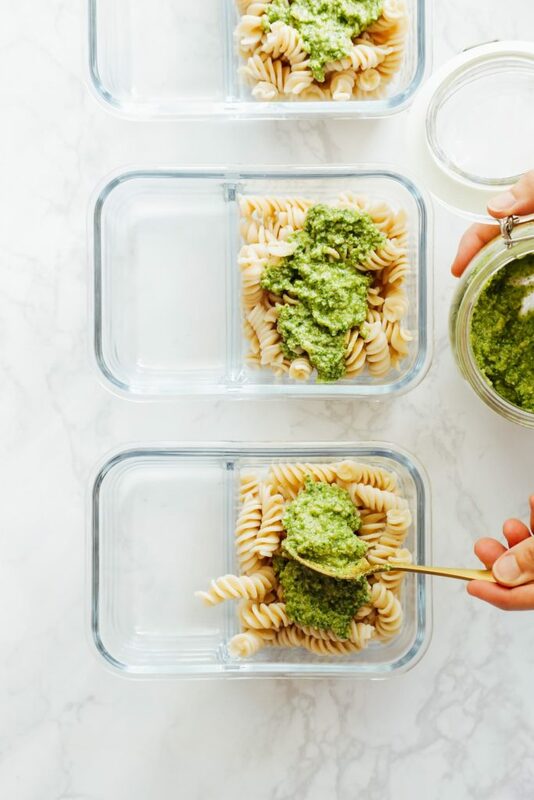 Time Saving Tip: If you want to save time, use a store-bought pesto. 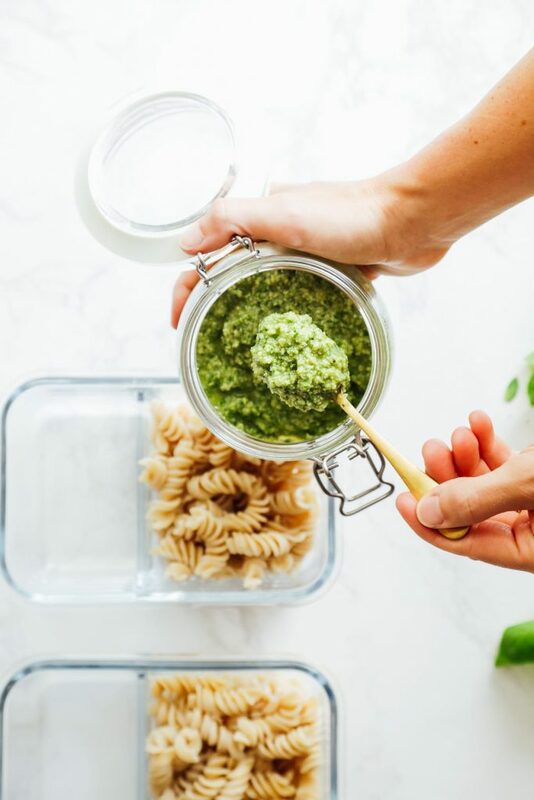 Look for a pesto with recognizable, real food ingredients. Once again saving my life with these prep ahead meals! Thank you! I usually leave the acid (lemon) out of my pesto, but then I’m assuming that’s why it turns brown fairly quickly. For make ahead I’d probably want to add it to avoid brown pesto. Just sayin’! Yay, Tamara! I’m so glad you’re enjoying the make ahead ideas!